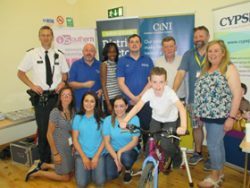 On 8 June 2018 the South Armagh Locality Planning Group celebrated International Children’s Day in Newtownhamilton with members of the local community. The event had a particular emphasis on promoting community engagement with the Bulgarian Roma Community in the town. Over 150 people attended the event which proved a great success in sharing cultures, food and creating a sense of enjoyment within the town. Activities for the day included traditional Irish, Bulgarian and Ulster Scots music, healthy food, fruit smoothies, Lego Walk, play sessions and face painting. There was also a Northern Ireland Fire Service demonstration and information stalls promoting the local support services in the area. A health needs assessment was also carried out with members of the community by Southern HSC Trust. 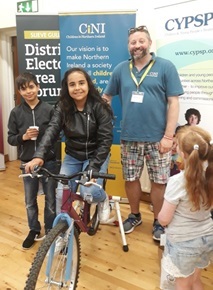 A special recognition has been paid to the planning group for the event and members of the South Armagh Locality Planning Group including the Southern HSC Trust, Sure Start, Newry, Mourne and Down District Council, Newtownhamilton Community Association and SPACE. This entry was posted in News, South Armagh LPG Images, Southern Outcomes Group and tagged news/events, South Armagh LPG, southern-og by Stephanie Thompson. Bookmark the permalink.